If you haven’t downloaded this amazing free app then you are missing out on some of the best free music of our century. 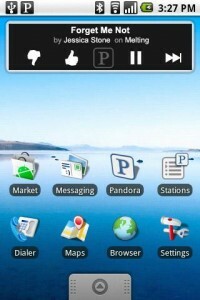 The Android Pandora App gives you access to unlimited free music all based on your particular music styles and taste. The music selection algorithm is amazing and very rarely has picked something that we didn’t like. Try this out today. If you like it, there is a pay service which is something like 20 bucks a year which gives you no ads and more channel creation options. Check out this app immediately!